A bit of serendipity gave Tanner Lords the chance to continue a tradition the men in his family prize. His grandfather, father and uncle all pledged Kappa Sigma Fraternity while students at the University of Utah in their hometown of Salt Lake City. Lords might have followed exactly in their footsteps, but his father's job as a dentist for the Veterans Administration Medical Center relocated the family to Dublin, Ga.
After graduating from Dublin High School, where he was a standout athlete, Lords looked at college options close to home. He enrolled at one area institution, never warming to it. Eventually, he transferred to Middle Georgia State and learned Kappa Sigma was the first social fraternity establishing a presence at the University. "I’m a legacy,” said Lords, 23, a reference to a pledge whose parents or siblings belonged to the same Greek organization. "Of course I wanted to get involved." Lords, a junior majoring in Business, is the general manager/president of Middle Georgia State's new Kappa Sigma colony. The other officers are Chris Hunt, vice president; Mitch Weintraub, treasurer; Kaleb Zhang, grand scribe; and K.J. Jang, grand master of ceremonies. As a probationary group, a colony must build toward certain membership and service goals before the national organization charters it as an official chapter. About 30 men are part of Middle Georgia State's Kappa Sigma colony, and they will make up the ”Founding Fathers" of the eventual chapter. Henry Whitfield, director of the Cochran and Eastman campuses and Kappa Sigma alumni, is staff advisor to the colony. Chan Jones, a Cochran businessman and associate's degree graduate of the former Middle Georgia College, is alumni advisor. He joined Kappa Sigma while attending Georgia College. "Fraternities and sororities will be great for Middle Georgia State," Lords said. "It's not like a student club. Once you're initiated in a fraternity, you're in for life." The University's Office of Student Affairs began working to establish Greek Life last fall. Kappa Sigma was the first to establish a colony. Other Greek organizations - Kappa Delta and Sigma Gamma Rho sororities and Phi Beta Sigma and Alpha Phi Alpha fraternities - are at varying stages of gauging student interest at Middle Georgia State. Greek Life is based on the Cochran Campus, which has adequate student housing to accommodate it, but participation is open to all Middle Georgia State students. "Joining a Greek organization can connect and engage students with new friends and help them learn how to be leaders, serve the community and maintain a strong network after graduation," said Dr. Jennifer Brannon, Middle Georgia State's vice president for Student Affairs. "For years we've had students express interest in establishing Greek Life, and after careful consideration we decided to move forward." Greek organizations sometimes get a bad rap, with stories of hazing and other misdeeds garnering wide attention. Perhaps less known are the abundant service requirements of most fraternities and sororities. Early in spring semester, Middle Georgia State's Kappa Sigma colony members organized a cleanup and landscaping project at the Cochran Police Department and hosted a 5K on the Macon Campus to benefit the Wounded Warriors Project. Members planned other service projects for the rest of the term. "Fraternities are not one big party," Lords said. "Part of their mission is encouraging service to others." The Middle Georgia State colony is attracting a diverse group. David Arnold, 24, of Eastman is a freshman General Studies major. Having put off college after high school while running two businesses, he saw the fraternity as a way to make friends quickly. It astonished him that "K-Sig" men he'd never met treated him like a lifelong friend the first time he wore his fraternity pin to an event. "It's true, there's no shortage of camaraderie," said Arnold, whose frat brothers rag him about the multicolored socks he likes to wear. A junior psychology major, Sheldon Doyle of Atlanta, joined the colony to "broaden my horizons." "I've met people and experienced some different things," said Doyle, 21, who plays for the Knights football club. "I like knowing I'll be a Founding Father and making history. (Future students) will know that we were the ones who started Kappa Sigma at Middle Georgia State." Lords believes Greek Life will expand Middle Georgia State's student recruitment base. "If you have a solid Greek presence,” he said, “people will come, because they want to be a part of it." Learn more about Middle Georgia State's efforts to establish Greek Life at http://www.mga.edu/student-life/greek-life.aspx. 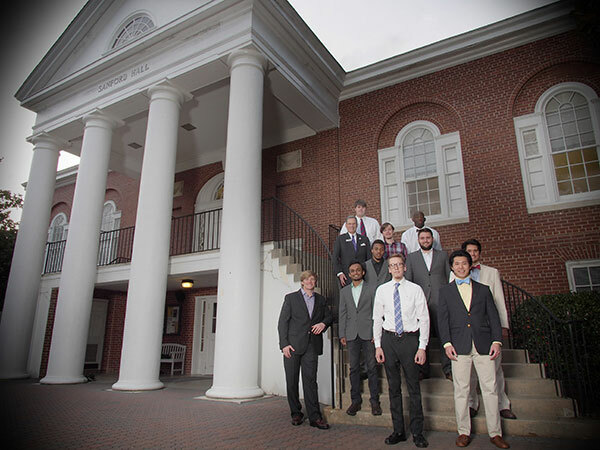 Photo: Here are some of Kappa Sigma's "Founding Fathers" at Middle Georgia State: Front row, left to right, is David Arnold and Kaleb Zhang. Second row, left to right, is Tanner Lords (arm on rail), Vaibhav Patel and Daniel Depuy. Third row, left to right, is Alex Jordan and Mitch Weintraub. Fourth row, left to right, is Henry Whitfield (staff advisor), Hunter Holland and Sheldon Doyle. At the top is Jonathan Coats. Photo by Jessica Whitley. This article originally appeared in the Spring 2016 issue of Middle Georgia State Today magazine.